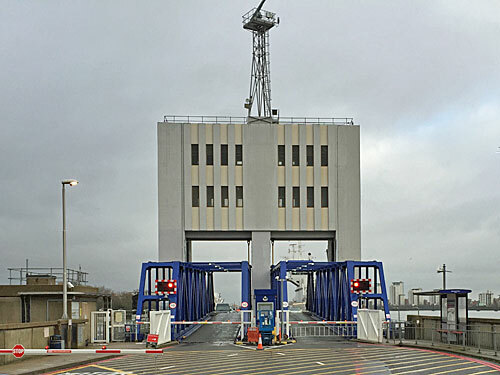 The Woolwich Ferry closed for a once-in-a-generation upgrade in October. It failed to reopen in December, then tried to reopen in January but failed again. Docking the boats using a newfangled magnetic docking system was proving tricky. But on February 1st a low-key 'limited service' began, with minimum publicity, and I went down to take a ride. Alas I turned up just as the service was being suspended due to technical difficulties with mooring, which was fine for me because I could walk away, but less fun for the vehicles and foot passengers stuck aboard. Yesterday I tried again. Success, mostly, sort-of. 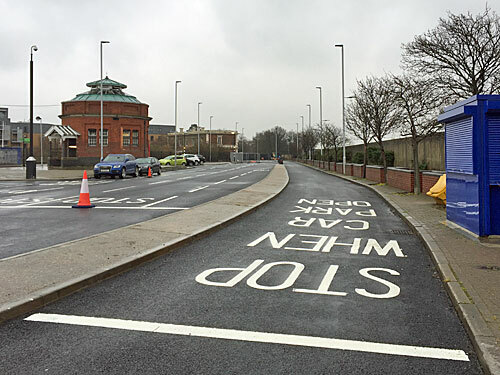 The approach roads to the ferry terminals look a little brighter because the opportunity was taken while the service was closed to spruce them up. If you're in a vehicle, all the better. But pedestrians aren't particularly well catered for, on either approach, especially when it comes to crossing lanes of traffic. On the Woolwich side it's easy to find yourself in the cycle lane, or stuck on an island waiting for hordes of traffic to stream past, while on the North Woolwich side no direct route to the start of the jetty is provided and roads must be crossed unaided. A few white stripes across the road would have been nice, or better signage, or at least something to make those on foot feel welcome. I wouldn't recommend it in a wheelchair yet. Because of the way the new ferries are designed, pedestrians now approach via the right-hand pavement in North Woolwich but still the left-hand pavement in Woolwich. Remember to board on the side nearest the river (or look for the repurposed bus shelter to show you which side to go). Cyclists should head in the opposite direction. The shelters are larger than those here previously but also more open, so less able to fend off persistent mid-river drizzle. The ferry remains free, because it would take an Act of Parliament to change that. I got to ride Ben Woollacott, rather than Dame Vera Lynn, these being the two craft replacing the three recently scrapped. 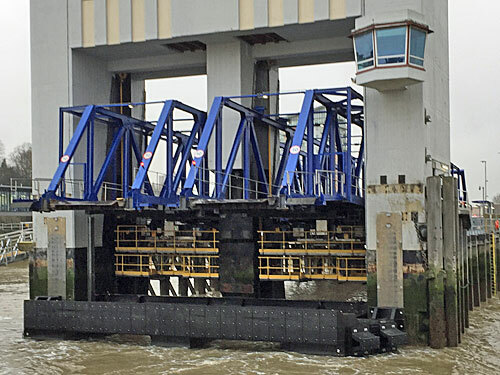 Once the ferry has docked (a phase I'll return to later) low-key electronic bleeps herald the raising of the barriers. Disembarking vehicles must be dealt with before embarking vehicles, obviously, but foot passengers get to cross in both directions at the same time. An automated system ensures everything raises and lowers in correct sequence. Crew stand guard to wave everyone through as required. Do not underestimate the repetitive all-weathers nature of the job that Woolwich Ferry workers endure. 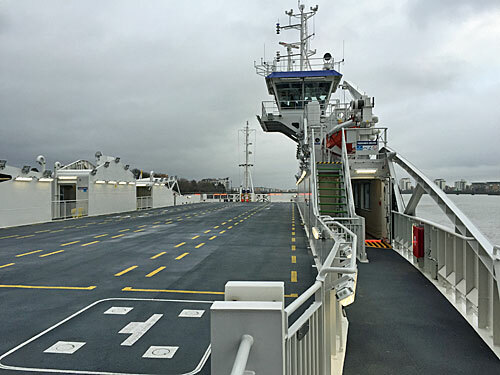 The new ferries maximise deck space for parking, increasing capacity. They're also asymmetric, with the crew's cabin elevated to one side and the passenger compartment directly underneath. Previously foot passengers were directed down into twisty passageways in the bowels of the ship, a bit like entering the Crystal Maze, but today they remain at deck level. The passenger cabin is very long and very thin, with a string of 67 seats along its length. Most of the seats face out, with a river view, while others face in. Some flip up. There is a wheelchair space should anyone get this far. The cabin is austere, more like an underdecorated waiting room than anything maritime. Normally when TfL have a wall spare they plaster it with posters or Dangleway adverts, but here there's nothing bar a couple of tiny lists of safety advice. At least you can always look out of the window towards the river, which is a big improvement on the old ferries, and if you're lucky there might be several passing boats to divert your eye. But the best part is that, even though there are sealable doors at each end of the cabin, you're not forced to remain inside during your voyage. Nobody locks you in, so you're free to wander out (at either end) (as often as you like) and stand on deck to take the air. There's even a decent amount of space. You might be waiting aboard for a good five minutes before the boat sets off, given how long the vehicle changeover takes. The on-board safety announcement is made by the same flat synthetic voice that haunts King's Cross tube station, rather than employ a human to make a one-off recording. And then you're off across the river, manoeuvring and spinning as required to make sure the ferry approaches from a downstream direction. This is the briefest stage of the river-crossing process, perhaps enlivened by a passing refuse barge, perhaps with a glimpse of Docklands rising through the mist. Essentially TfL are offering a Thames voyage for free, admittedly not in the most scenic part of town, nor lengthy, but far cheaper than the Thames Clipper alternative. 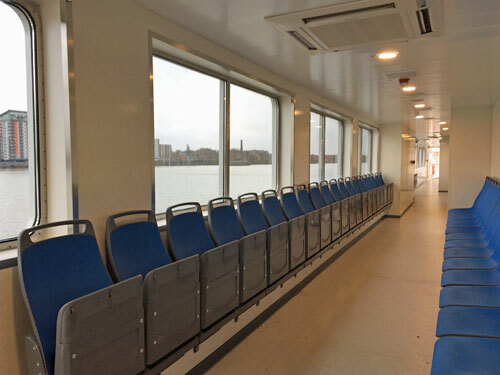 The new Woolwich Ferry operates with spanking new 21st century technology, not 1960s docking procedures. That's brilliant, and why the refurb took months to complete, but my word how it's slowed things down. 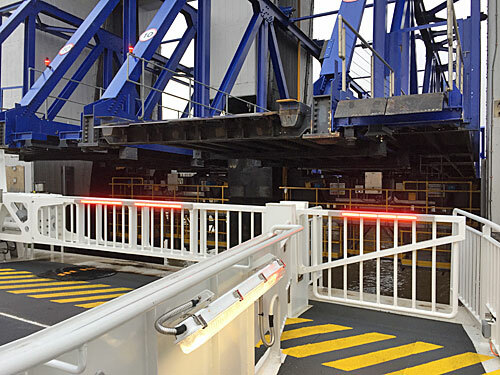 Magnetic pads have been placed at the foot of each docking tower to ensure that the ferry always aligns correctly with the vehicle ramp. It's supposed to speed things up, but instead the boat has to nudge forwards to precisely the right place to become attached. We took a couple of goes to get it right, and then a couple more, edging in sort-of diagonally to try to hit the sweet spot. Whatever they've been practising since the new ferries arrived, they've not got it off-pat yet. I wish I'd been timing the approach, but I reckon we must have been bobbing off Woolwich pier for a good ten minutes before connection was eventually made. 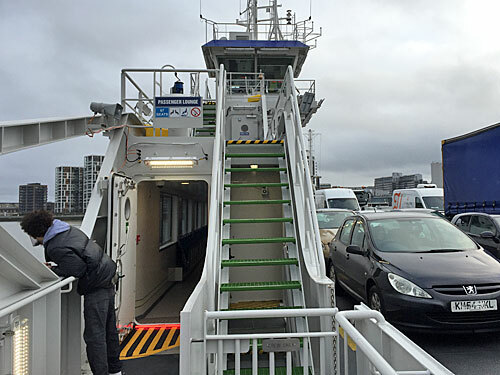 By this stage passengers were massing morosely at the front of the ferry, and one was cursing audibly to anyone who'd listen, as well as ringing up a friend to unload her disgust. This was not an impressive service. I hung around a bit and watched other crossings, and crossed back across the river myself, so I know this mooring delay is not uniform. 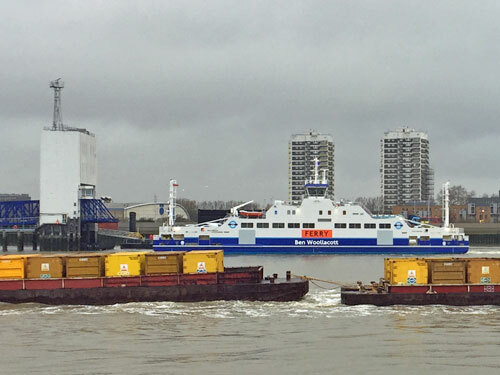 It seemed shorter on the North Woolwich side, more like two or three minutes, but every ferry I saw trying to attach itself to Woolwich pier took noticeably longer. It's perfectly possible that specific river conditions were in play during my visit - tidal flow can reach 4 knots at times - which'd make manoeuvring particularly tricky. I don't want to draw over-simplistic conclusions from a single afternoon, but yesterday it would've been a lot quicker walking through the foot tunnel than enduring all the faffing on the ferry. According to the TfL website, the Woolwich Ferry runs "every 5-10 minutes throughout the day, from Monday to Friday". There is no way the two new ferries could ever hit the '5' end of that spectrum, even if everything were working perfectly, because loading and unloading take too long. 10 might be doable, but only if magnetic mooring worked first time, and I fear 15 may be closer to the eventual reality. The preview service is currently managing more like 20. 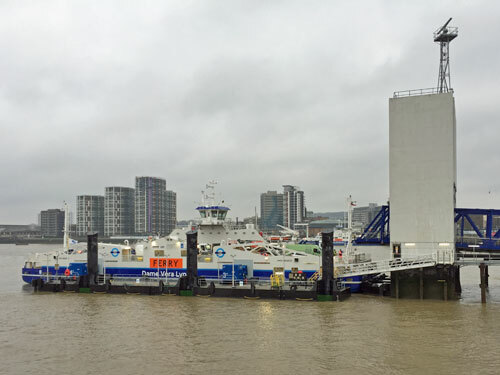 It's brilliant that the Woolwich Ferry is up and running again, freely linking two sides of the Thames for drivers, cyclists and pedestrians. It's excellent that investment has ensured this age-old ferry crossing has the infrastructure to continue for decades to come. But the technological advances at the heart of the new docking system have created issues which don't look like being sorted soon, and we may just have sacrificed reliability for sustainability.